Oooh god...... That's going to be interesting. Have a fun ride reading this everyone! 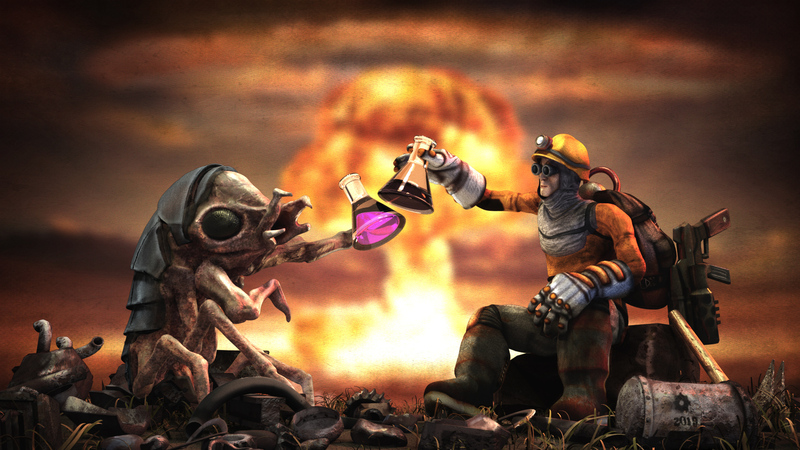 Also, this is probably the most detailed picture we have ever seen of our Factorio Guy. I don't like the walls in military and rails in production. There is just to little stone on the map and it is to hard to get. Cheaper military science is nice as the turret always seemed a bit expensive. Don't really care about all the other changes in the recipes cause I can just replug the cables on my science area. I really like that you can now see clearly which science packs to what. Much needed change if you ask me. Combining of the military upgrade techs is great, too. They had no real purpose to be honest. The game victory condition is to build no spaghetti, at least for me. Merry Christmas, Happy New Year and I am looking forward to smash the bug report forum when 0.17 is released. PS: The explosive graphics blend together with the weapons. That needs to be changed. Last edited by SuperSandro2000 on Fri Dec 28, 2018 2:07 pm, edited 2 times in total. I don't like the walls in military and rails in production. There is just to little stone on the map. And there's only a few more weeks until we get to play with it. These new changes are going to be great! What can we expect? More stone? better variation, scaling or form of the patches? Merge of RSO? Totally forgot that. Hope that it feels balanced and stone is not the new iron plate. Coal and Stone should always be more than enough. I like the changes overall, but I'm not a fan of the amount of rails needed for production science (just as I'm not with the copper cables right now for high-tech science). This is mainly for logistic reasons: With the other science packs, I can put in a few blue belts, perhaps some of them shared between resources, that are used roughly in roughly the same amount. However, if one ingredient has a count of 30, I need almost a full blue belt of that ingredient alone, while the rest of the ingredients combined only need 15% of a yellow belt's throughput. It feels wrong, and in my opinion it doesn't look nice either. Sure, there is a number of ways that I can work around this in a megafactory (e.g. 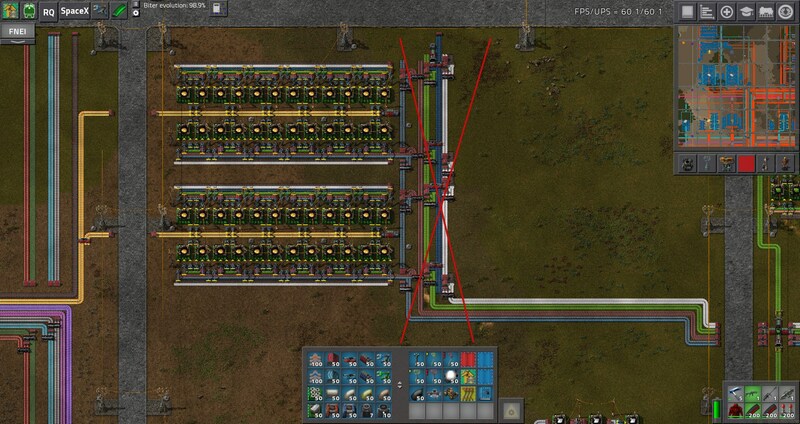 feed in 20 blue belts of rails, and one half belt each of furnaces and productivity modules, then split that up between 20 production lines), but I don't think that is a real challenge logistic-wise, and won't look nice either. So the obvious solution would be to supply all of it with bots. And here we are at the bot vs belt discussion again, in which the bots win this time, simply because: they have no throughput limitation per se. I don't care if it's 8 bots delivering rails and 2 bots delivering furnaces and modules. I can build a nice-looking factory block and produce everything close by in the correct ratios. You can just use direct insertion and be fine with it, don't need bots. IIRC they wrote in the FFF that you should directly insert it like cables for circuits. Additionally science packs take a long time to craft so you don't need 30/s for a long time. Speaking of...can we get a way to prevent construction robots from deploying and chasing moving vehicles? They just get left behind and die every time the car hits a tree, the train gets a random hit from a biter, etc... wasted resources and annoying notifications. Ohhh, you're visiting tech trees. Back in January there was a FF about bots vs belts. 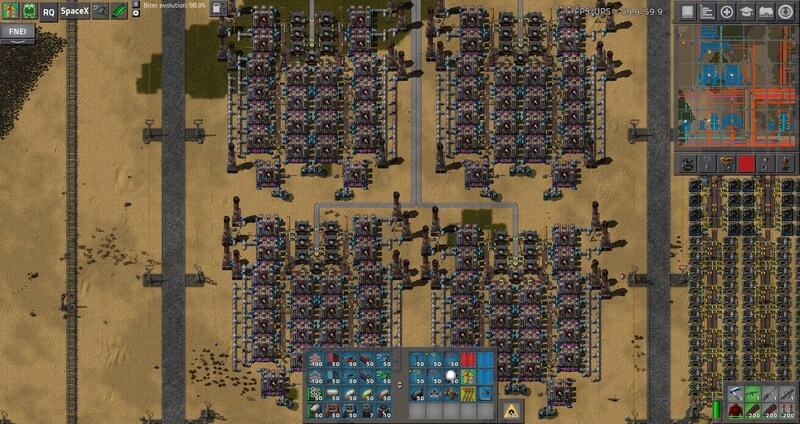 This significantly impacted my gameplay this year - now my 3000 science 2 rocket per minute base is back to 90% belt+train factories rather than 90% robot factories. It is visually appealing - you can see the goods enter each base on a train, be sent onto belts and through the processing machines, out onto belts and onwards onto trains. I'd really like to see both a 2x1 loader in the mid tech tree, maybe after red belts, and a 1x1 loader introduced as an expensive end game tech requiring space science to research and blue chips to produce. The 1x1s transformed the quality of the belt-based factories I could build making them fun and manageable. With 1x1s I now I have high density beacon setups producing green chips in the volume you need for late game, something only possible before with really robot builds. Pure robot bases... well, you covered it in the blog. They're not aesthetic and lead to really boring copy/paste late factories where everything is a row of two beacons, an assembler, and a blue and red chest. I like the changes. They'll be fun to rebuild for once the patch hits. I loved the changes. Some of those changes were already being introduced by mods (the name convention), and simplifying the military science is a must, since, even for me, an experienced player, got frustrated on the damage bonus on combat robots (I always had to use the Bonuses tab to actually understand it). The removal of military science from rockets is a great thing as well, since many people play without biters. Now, I think launching the Rocket without anything on it should be disabled by default, and let mods enable it. It makes no sense at all launching a rocket with nothing on it, and having the satellite as a pre-requisite is totally reasonable. What's not is that the UI lets you launch a rocket that does nothing! Instead of the win condition being no satellite, putting one means the player will at least see Space Science, and may get intrigued by it, giving further reason to continue playing the game. Im fine with more stone usage, it felt like a step child at points. Ore generation settings might screw up some older bases, but as this should be a huge step towards 1.0, its a perfect time to start a new one. FFF-275 wrote: Grenade stays as it’s a very useful weapon against large groups of enemies, like biters or trees. Yeah, those fearsome trees, our worst enemy... I prefer Flamethrowers, nothing is as satisfying as seeing a giant forest burn to ashes. The only thing I would disagree with here are the productivity modules for production packs: All the other things are going to be used sooner or later, but it is very well possible to never use prod modules, so this feels like you are trying to force us to use them(especially Level 1, which I never saw used anywhere).